Too Many Cooks presents: the ultimate mobile-slots-inspired menu! With Too Many Cooks as our Game of the Month, our four master chefs are currently in charge of PocketWin HQ. They’ve mostly been barking orders to the sous chefs, being extremely picky about presentation, and just generally cooking up a storm. 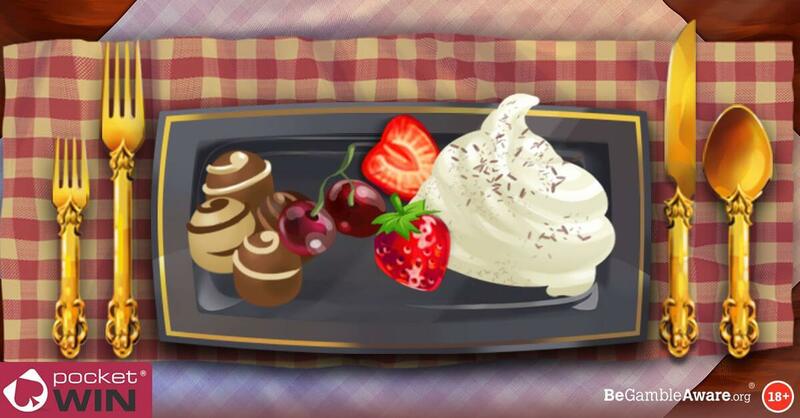 Cooking in the company of so many great slots games means they have plenty of inspiration for menu ideas, so the four of them have teamed up to create the ultimate three-course menu to complement your next casino gaming session. Naturally, they can’t all agree on anything! So, they’ve come up with a few ideas for starters, mains and desserts for you to choose from, all inspired by PocketWin titles. Bon appetit! A light, juicy entrée, plucked from the enchanted woodland of the Lucky Forest Casino. Delicious served solo, or accompanied by a fresh fruits-of-the-forest jam with hints of the mouth-watering £15,000 progressive Jackpot. With a little help from the Benidorm or Bust crew, our chefs have created their very own signature Spanish omelette that captures the spirit of this seaside sunspot. Naturally, it’s served with lukewarm sangria for that authentic finish. We hear that the Golden Empress is partial to tempura prawns, so our cooks have created a very special dish just for her. This one is full of the distinctive flavours of Japan, with a twist of spice to reflect the excitement of the Golden Circle mini-game. This Highland delicacy has us dreaming of sunny days on the shores of Scotland’s stunning lochs, however it’s probably best that we don’t go into detail about the actual ingredients. Just trust that our chefs and their cultural consultants from SlotNess know what they’re doing. Fancy sampling the flavours of the Far East? Our chefs have collaborated with Master of Fortunes’ Mythical Master to create a dish that encapsulates the exquisite flavours of south-east China. Served in an extra-large portion to reflect the enormous £41,000 Jackpot. Sherlock Holmes didn’t have the best stay at chez Baskerville, but apparently the food was spot on! So, our chefs have served up a beautifully-cooked brisket that’ll make you feel like you’re dining in an English stately home. Just remember, beware the dog. A fresh and fruity dessert is the perfect end to any meal, so our cooks have chopped up some of the Pocket Fruits symbols to create a succulent fruit salad. Fruits may vary, but it’ll always include the bananas progressive Jackpot of more than £83,000. Seeking something a little more savoury? Well look no further than the immensely popular Cheese (Chase) Board. Along with the Gouda, Brie, Cheddar and Stilton, they’ve also included the crackers £22,000 progressive Jackpot. Our chefs are no snobs, and they know a good old-fashioned ice cream sundae is always a crowd-pleaser. So they’ve taken the flavours of Iced Wins and combined it into the ultimate dessert, sprinkled, of course, with hundreds and thousands. Which mobile-slots-inspired meal choices would you pick if you could dine at the Too Many Cooks restaurant for real? Let us know on the Facebook page!